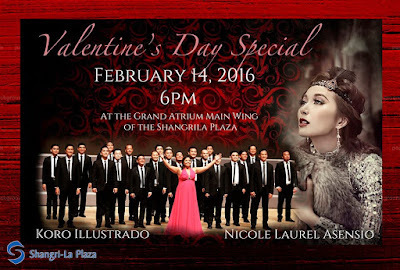 This Valentine's Day, prepare to be serenaded by the smooth tunes and runs of the one and only "schizosoprano" Nicole Laurel Asensio together with the premier all-male choir, ‪‎Koro Ilustrado‬. This concert will be held on February 14, 2016 at 6:30pm, at the East Atrium, Shangri-La Plaza Mall in Mandaluyong City. Admission is FREE!